Extending the pleasure of your garden immensely, moonlight and star shine will illuminate flowers and foliage making the garden at night a different experience, almost surreal and magical. It can be especially enchanting when fireflies gently meander through the air, adding their ethereal glow to the landscape. At nighttime, the garden develops hidden depths as the colors fade in the dusk. Red takes on a deep mysterious glow until it is lost into darkness when only the palest flowers begin to glimmer. 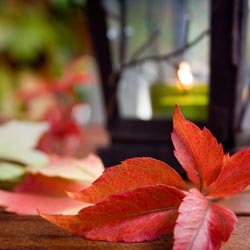 Foliage casts shadows that soften the harsh corners of decks, sheds and structures. Scents are more apparent after a warm day as well as a calm, soothing feeling descends, and pesky biting insects retire as well – this is truly a wonderful time to enjoy your garden. Enhancing the moonlight is a great way to create a spectacular night-time garden. Artificial light, besides serving a practical function, can add more interest to the evening garden, illuminating pathways and highlighting specific features. Accent lighting creates a dramatic effect. Uplight trees, sculptures, pergolas, arbors, or large shrubs with recessed, understated lighting features to create a luminous glow. 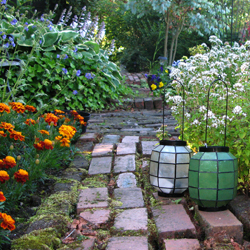 Create down-light from above to ‘moonlight’ paths or patios with either tall light fixtures or smaller pathway fixtures. Add portable light with lanterns, torches and simple staked candles. This is great for barbeque areas, decks and entertainment areas, helping increase illumination for better visibility and evening energy. Candles are also nice because their flames flicker in the breeze and create shadows and reflections, but if it is too windy, be sure the flames are protected from vigorous breezes that will blow them out. For the most dramatic nighttime lighting in your garden, consider specific features that will become showstoppers after dark. An elegant fire pit can be an evening gathering place and just the right spot for roasting marshmallows and chatting with friends. A waterfall or fountain can also be carefully lit to create an elegant, mystical mood with eye-catching sparkles as the light catches every splash. To make the most of your garden lighting, position lights so they do not shine directly in your eyes as you move through the garden. If you are near a street, make sure your lighting won’t be canceled by streetlights, overwhelmed by passing traffic or distracting to drivers. You don’t need to stop enjoying your garden when the sun goes down. With the right illumination – making the most of natural nighttime light and enhancing it with carefully chosen lighting – after dark can be when your garden really shines its brightest.